Animal Song: Godley or Creme vocal? Having said in my Fading Yellow Vol 4 review two weeks’ ago that the ‘rapturous vocal’ for track 6, Animal Song (Godley and Creme 1969 B-side under the unlikely name Frabjoy & Runcible Spoon) was by Kevin Godley, an article in April’s Shindig (page 69 sidebar) gives the vocalist as Lol Creme (though Shindig say Kevin was responsible for the folk-country A-side, I’m Beside Myself. Now I’m confused. What do others think? Take a listen under #6 on Fading Yellow Volume 4. Either way, it’s a gorgeous vocal. No, my Fading Yellow reviews haven’t disappeared, maybe just faded for a while. I wanted to review the volumes in order which meant tracking down the elusive Volume 4. It’s a solidly enjoyable collection. I hope you will find it easier to pick out individual tracks than in previous Fading Yellow reviews. ‘I’ll fly the morning sky and then I’ll fly away’. A fine melodic start to this comp. Wistful harmony folk-pop not unlike Simon and Garfunkel crossed with Christie with an echo of ‘Across the Universe’-Beatles. Producer Mike Batt brings sparkle to acoustic guitar strings whilst maintaining an overall natural vibe. Bob Ponton (who wrote Morning Sky) and Martin Curtis were ex members of Pandamonium (not the Manchester based group of the same name). There is a 13 track Liberty album also produced by Mike Batt with a cover depicting the duo in a woodland setting which I have not yet heard. From The Huge World of Emily Small the Line’s only album (Picadilly was intentionally spelt with one ‘c’ since London Underground owned the copyright to the original though Fading Yellow adds the second). The duo were Welsh born Ron Edwards and Roger Hand who began as folkies before being signed to CBS for an album of very 1967 lightly orchestrated folk-pop-rock. The arrangements are John Cameron’s, fresh from his revitalisation of Donovan’s career via Sunshine Superman and Mellow Yellow. ‘Emily Small’ shares many of the same musicians – Danny Thompson on bass, Harold McNair on flute, Tony Carr on drums for some tracks – but the arrangements never quite fly as freely as they do for Donovan. At the Third Stroke is a little twee at times (‘the circus returns to the town’), but is redeemed by an undercurrent of mystery or incipient threat. There’s a feel of Chad and Jeremy in its determination to fully paint a scene and a tasty guitar sound which I know from somewhere. I’m not sure what the ‘at the third stroke’ aspect of the song is apart from an obvious reference to the then ‘talking clock’ telephone service and this being the third track. A concept ran through the album but it was enigmatic at the time and utterly lost a half century later. The Majority (1965-69) were an accomplished band especially in their later Majority One incarnation (1969-71) as 2005’s Rainbow Rockin’ Chair comp shows in abundance. This is an enjoyably multi-part love song written by Grapefruit’s George Alexander with baroque flavourings, Beatlesque moments in those ‘I don’t know’ backing vocals and perhaps a flavour of ‘Man in a Shop’ era Marmalade. Micky Jones and Tommy Brown’s promising first release before changing their name to the more zeitgeist State of Micky & Tommy. Here we have a post beat/just pre-psychedelic sound, so it’s electric guitars with sometime strings which enjoy some nicely augmented moments. B-side to I Could Be So Good, this Essex band released three singles around 1969/70 and this is the second. B-side to I’m Beside Myself (on the fabulous Marmalade label) and both sides written by Godley and Creme, Animal Song is charmed and charming, an escape into a beguiling realm similar to the more mellow tracks from Godley and Creme’s 1970 album as Hotlegs. Intriguingly imaginative before they placed too much cleverness between them and their music. 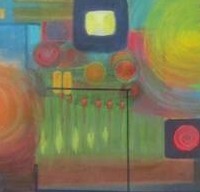 Buzzing cello, clanging guitar, organ, telegraph wire strings and a slowed down lysergic mood. The B-side was an instrumental version. Monday Morning rain was just too outré to make it. The sleeve says produced by Larry Page and written by Chip Taylor. A trippy fantasy of loneliness and yearning – wonderful. The singer is missing his love but seems strangely content to remain in an enchanted world. B-side to Carter-Lewis’s poppy Say Goodbye to Yesterday, this is ambitious and beautifully put together and will truly take you on a journey. A portentous vocal recalls Moody Blues as do lyrics such as ‘and in the depths of deep unconsciousness you’ll find you’re on a journey to the cities of your mind…’ I can almost hear early Family too. A fine arrangement overall though I’m not sure about the wailing backing vocals… still, this scrapes to five stars. How come they only made the one 45? Written by Carter-Lewis in their Ivy League vein with echos of ‘Sealed With a Kiss’, That’s What I Want has been recorded since 1963 by The Cicadas, The Marauders, The Liverpool Five and probably others. The Candlelight’s version comes with dense harmonies, ‘cello and nice guitar work. This works up a little to be like Hour Girl (The Rites, #10, Fading Yellow 2) but not half as powerful. B-side to Travelling Circus. Written by Chip Hawkes and produced by ex-Tremelo Alan Blakley, Henry Long perhaps sounds later than 1968 with that compact piano sound and the electric guitar break. I’m sure there’s a story in there somewhere. ‘Travelling Circus’ b/w ‘Henry Long’ was The Epics third and final single release before they morphed into Christie but not before releasing the Roy Wood produced ‘Round the Maypole’. Big drums, big production, surf-influenced vocals and a girl group influenced sound… dramatic brass, strings, harpsichord flourishes set to fairly banal girl/boy vocals. Those descending piano motifs do give a sense of ‘when the night closes in’ though. Finders Keepers included future Deep Purple member Glenn Hughes but, that apart, is one of the less interesting tracks here. The trippy B-side to Say Shalom on Buddha with a desolate bookending (well, OK, breath wind effects) trippy, drony and vocoded backing vocals and – trumpet. The rather knowing picture sleeve portrait of Martin Martin in shades suggests he was well hip to the vibe of ’67. Cook-Greenway produced and wrote the A-side I’ve Always Wanted Love whilst group member Paul Young went on to Sad Café. Not the Pinkerton’s Assorted Colours song, the melody recalls Jimmy Campbell’s ‘Forever Grateful’ from his 1970 album Half Baked. Knowing this A-side pairing represented his more upbeat northern soul side, I was eager to hear it, hotly anticipating Robbi would inject excitement into proceedings, which he does from the word go with pounding drums/bass, dramatic stop-start ‘Smash!’ ‘Damn!’ lyrics before we open out into full chorus with brass and flutes. This slab of hi energy dynamism is a great pairing for its dreamy B-side though ‘Diana’ remains the single’s crowning glory but see also #25. Written by Tony Catchpole, this was B-side to Deram single Gypsy Girl. I’m getting to find out more about this band through various fragmentary sources. According to Fading Yellow‘s notes, this A-side orchestrated pop piece was written by Al Gorgoni of The Flying Machine and Bobby Weinstein. Of Follow Me and The Cooks of Cakes and Kindness fame, this is the swinging pop B-side from The Californians first single, Sunday Will Never be the Same (a hit for Spanky and Our Gang). A survey of the titles of Wayne Fontana’s 1967/78 singles – 24 Sycamore, The Words of Bartholomew, Storybook Children – show how eager was he to jump aboard the psychedelic bus. After a portentous beginning this sympathetic exploration of the mixed emotions of adolescence develops into a characteristically minor-key Graham Gouldman revelation complete with plucked strings, precision trumpet and that Gouldman giveaway final off-tonic strum. Gouldman was bassist with the Mindbenders and recorded his own version of The Impossible Years for The Graham Gouldman Thing LP. Gouldman’s English enunciation and baroque stylings add a delicate feel but Wayne Fontana provides more edge. Hats off to Fading Yellow’s policy of featuring rarer tracks from artists not associated with psych, sike or psychedelia showing how almost everyone was touched by the changing times. This is a Sergeant Pepper influenced invitation written by fellow Mindbender, Glyn Ellis aka Wayne Fontana. This achingly idyllic track from Sing, John Bromley’s 1968 Polydor album, is consummately gentle folk-pop with wispy female backing vocals courtesy of Yvonne ‘Sue’ and Heather ‘Sunny’ Wheatman. John credits Graham Dee as probably having come up with the idea for the female counterpoint melody. The arrangement is by Gerry Shury who, despite his later pop-soul leanings, here turns in a gorgeously understated baroque accompaniment. B-side to The Magic Book, with a more US flavour though there is a Beatles influence to some of the vocal phrasing. The band hailed from Australia but came to England in 1965 – hence their inclusion here. B-side to 1967 Bee Gees’ penned single Forever, this is a highly wistful song written by Ian Hunter (given as Ian Patterson here). You can straightaway tell it’s Dave though even through the heavily vocoded vocal. 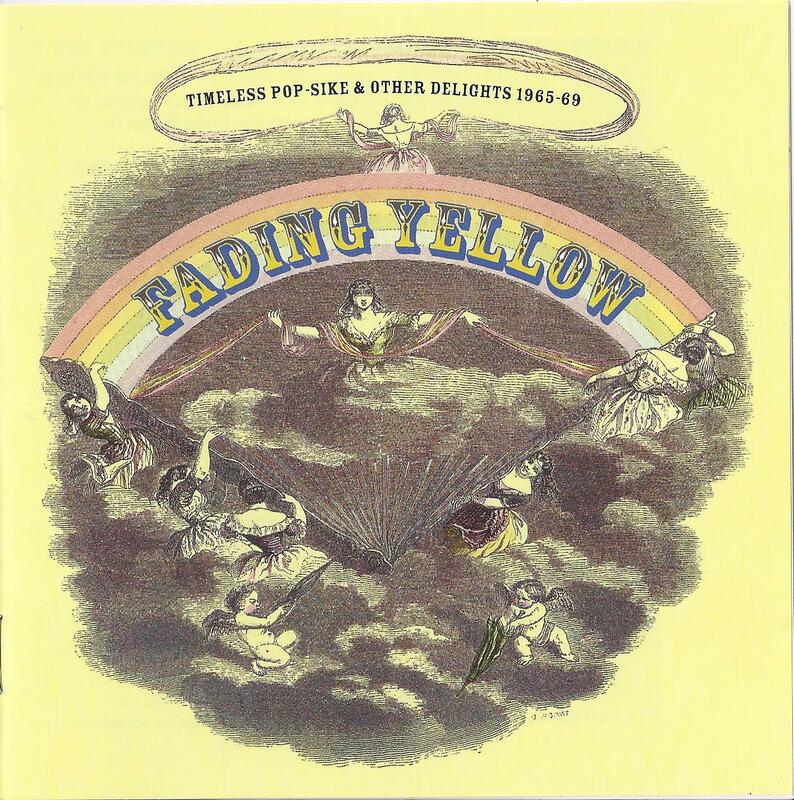 His best chart-era single was 1970’s Chaplin House, captured on Fading Yellow Volume 12. A sobering, atmospheric B-side (produced by Ivor Raymonde) to I Hear a Rhapsody – ‘in the cold light of the dawn you will understand’ – also recorded lower, slower and more sombre still by Just Us. David is the son of Marc Chagall! A stoned, self-written A-side complemented by rich harmonies and string/woodwind arrangement though sub-par sound quality. It’s atmospheric but doesn’t quite do enough despite a springy energy, hinting at a breakout into something which never arrives. Robbi Curtice truly operates at the crucible of mod, soul, psychedelia and – music hall? Well it worked for The Small Faces. An assured touch from the very start with a Billy Nicholls’ cheekiness and a vein of quirky graveyard humour all set to a catchy melody. Gospel Lane was written by Rob Ashmore and Tom Payne and feels like it wants to break out into a big arrangement but doesn’t perhaps because this is a home recorded demo. The track is dated 1969 by Fading Yellow but Robbi Curtice’s Youtube upload says 1968 so let’s go with that. I hold the next volume in my hand so hopefully the gap won’t be quite as long before Fading Yellow 5 fades into view. This world is big and wild and half insane as Ray Davis once said. So why not curl up with Fading Yellow Volume 3, a veritable cornucopia of multi-flavoured aural delights? Any scoring system fall falls down at times and this volume I’ve struggled with my three and four stars. Three and a half isn’t an option so where in doubt I’ve opted for four. The fives are the standout tracks. Of that I have no doubt. I couldn’t get along with Eddie Hodges Shadows and Reflections **** at first because the lyrics seem at odds with the military march of the music. Then I heard The Action’s version and at once the song fell into place. The Action offer atmosphere and an edge. Eddie Hodges gave us the original I’m Gonna Knock on Your Door in 1961 (the Jimmy Osmond version was the bane of 1972) but he also co-wrote Along Comes Mary with Tandyn Almer (who co-wrote Shadows and Reflections) so superbly covered by The Association. There are interesting and quite stark harmonies in It Will Never Be the Same *** by the superbly named Wiggs Of 1666 but it’s a shame about the slightly distorted sound quality. Jim Ryan of The Critters produced and plays on Giant Jellybean Copout B-side Look at the Girls *** and, as you might expect, it’s smooth, harmony pop with dreamy vibes. An air of dreamy wonder also pervades Network’s The Boys and the Girls *** another 1968 B-side. Then, as with the middle of Volume 2, we hit three great tracks in succession. Saturday’s Photograph’s Gentle Loving San Francisco Man ***** is the sound of blissful loving contentment. It’s a warm-hearted and evocative piece of jangly flower power folk-pop which also happens to be a very well crafted song. You must have heard songs which, upon first listen, sound like something you already know or feel you have always known – well San Francisco Man is just that because it’s so instinctive and simply never puts a foot wrong. In the female vocal you can hear the song’s routes in earlier-in-the-decade high school girl-pop but the greater maturity, a mellow vibe, harpsichord and those deliciously ‘Indian’ sliding string passages leave us in no doubt that times have changed. The lyrics are a virtual manifesto for the sensitive, poetic Aquarian male. I especially like the line ‘If somebody puts him down he’d pretend he did not hear, And he always walked away the better man’ – five years earlier and Johnny would have flattened the other guy with a sock to the jaw and been a hero to the girl for having done so. Now peace and love are the new virtues. The only note of doubt sounded amidst the air of complete contentment is the cautionary ‘And I hope to God I’ll always be around him’ – sung with a slight emphasis. I had this down as pure 1967 which spiritually it surely is but it was actually released in 1969. That perhaps accounts for its lack of chart success. The next ten tracks serve up an enjoyable variety of songs without turning-up anything truly exceptional. The best of the ten is Voyage’s One Day **** with its interesting variety of psychedelic sounds – repeated brass motifs, busy cellos tumbling through a sound tunnel, a husky-voiced verse or two, chromatic orientalisms, traffic concrete, all in a circular day-in-a-life voyage which takes you back where you began. The construction is unusual as the opening brass melody isn’t heard again until some way into the song, suggesting a kind of late-in-the-day bridge which turns out not to be a bridge at all. This is unlike anything else on Volume Three. If it’s snotty sixties vocals with organ you’re after you’ll find them on Springfield Rifle’s Left Of Nowhere *** alongside something a little more ethereal. Lamp Of Childhood’s First Time, Last Time *** offers fine string-backed harmonies with a kind of Mamas and Papas influence. Toy Shop by Trolley *** has a spinning tops, miniature merry-go-round feel and could be a kind of companion piece to Mark Radice’s Wooden Girl. Take A Look in the Mirror *** – ‘what at first seemed so pretty isn’t pretty after all’. There is a Byrds-like feel to this [piece from East Town Kids with nice guitar work and urgency to the vocals. London Phogg’s The Times To Come *** This sounds like, and is, from 1969 with its pattering drums, and (for Fading Yellow) bursts of blistering guitar married to rapturous vocals. There is a warm Pet Sounds vibe to Carnival’s B-side I’m Going Home Tomorrow *** while Gaitley and Fitzgerald’s Séance Day *** with its parping bassoon, shivery strings and strutting guitar has a faint recall of Curt Boettcher tracks like Hotel Indiscreet and I’m Not Living Here but with a certain Addams Family vibe. Scandal’s Girl, You’re Goin’ Out A My Mind *** offers enthusiastic vocals and some ba-ba-bas before we reach the top track of Volume Three. Robbi Curtice – When Diana Paints The Picture ***** I love this song. It simply exemplifies the way artists in the 60s could take a common genre – the love song – and make of it something completely original whilst employing a memorable melody and sympathetic arrangement to do so. And incredibly, this is the B-side. When Diana Paints the Picture has 1968 written all over it – the transformative ideas of the counterculture filtering through to pop, the dreamy but full arrangement in a style not dissimilar to Burt Somner or Nick Garrie’s The Nightmare of J.B.Stanislas album, the emphasis on feeling rather than appearances (‘it isn’t what she sees but what’s inside her heart’). The lyric also casts the singer in a self-deprecating light which is never a bad thing. Diana (the name means heavenly or divine) transforms the singer’s perception of himself when she ‘paints a picture’ (I don’t think it means literally ‘paint’ although you might choose to take it that way). The song also draws upon ideas of the world turning from black and white into colour during the 60s such that the song itself seems to generate a kind of colourful psychedelic swirl. The cascading wind-chime silvery bells which colour the introduction and opening line are a bit of a distraction but don’t detract from this being a fabulous song. Enthusiastic, youthful vocals, some ba-ba-bas, woodwind, busy strings, a bashed cymbal and somewhere a Wurlitzer make up for a crazee good-time feel in Chicago Loop’s This Must Be the Place *** This was produced by Bob Crewe who co-wrote many of The Four Seasons hits and songs for many other artists. Sadly Bob died last month at the age of 82. ‘It’s a pastel world’ according to Saturday’s Photograph. I find this kind of sun-dappled mood music hard to resist when it’s as soft and seductive as Summer Never Go Away ****. It’s flutey and kinda warm but cool too. Last up is Cadaver’s Haven’t Got The Time *** which lifts off into an enjoyably unexpected harpsichord/guitar instrumental break. This is a solid collection. It lacks the minor key feel which unified Volume 2 but there is a varied selection here. Most lovers of pop-sike should come away finding something to treasure. 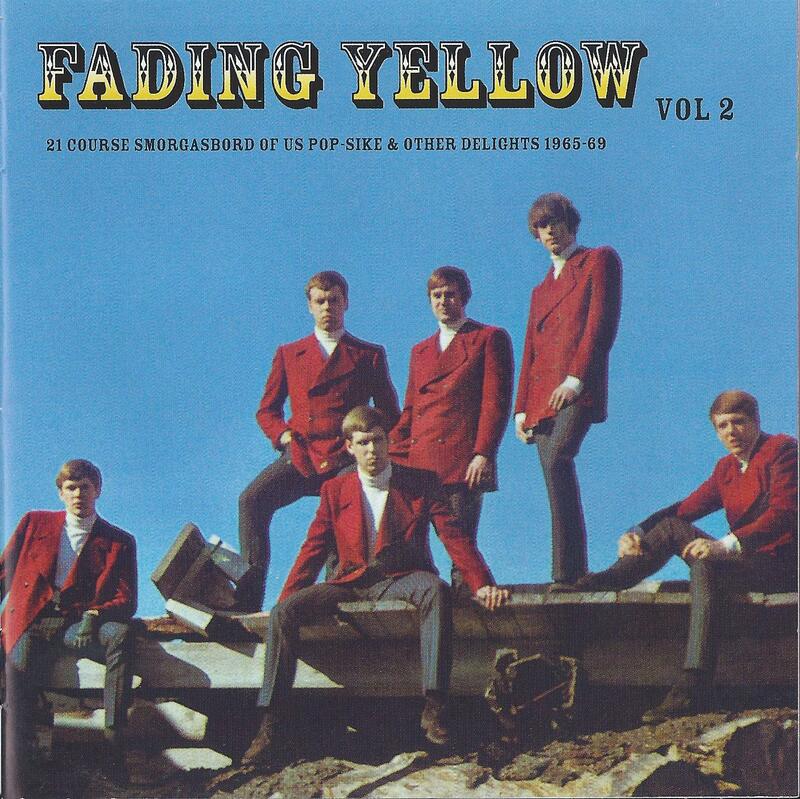 Both Save Your Money and Wooden Girl, the A and B sides of Mark Radice’s 1967 single would be among the strongest tracks on Fading Yellow Volume 3 if written and performed by a twenty or thirty year old. Mark was aged only ten. Neither are they the kind of sugary pap one tends to associate with child prodigies manipulated by producers with dollar signs in their eyes. No, this being 1967, a more intelligent and less overtly commercial approach is taken. Wooden Girl especially, takes the fact that the singer is aged ten and then does something interesting with that, so we have something genuinely intelligent and engaging going on here. I’d describe the sound as kind of homespun Sergeant Pepper meets spacey Hannah-Barbara. ‘Save Your Money’ and ‘Wooden Girl’ both feature catchy melodies (‘Wooden Girl’, incredibly so), slightly off-kilter, not overly produced arrangements and a canny knowledge of how to take the styles of the day and weave them into something a ten year old might sing about. That father was recording engineer Gene Radice must have helped but there is no getting away from the fact that these songs simply stand out. My only gripe with Save Your Money is that I can’t make out some of the lyrics and therefore lose the story – not Mark’s or the production’s fault at all, just the sound quality of the recording here. Clavichord-rich B-side, ‘Wooden Girl’, is a very infectious piece of psych-pop which a band like Kaleidoscope might have come up with and is even stronger than Save Your Money. The story of the wooden girl is the classic tale of a child’s make-believe friend gone a little too far so she is more real than the people around him. You’re not always quite sure on first listen which elements of the accompaniment are Mark’s voice-as reverbed-backing-vocal and which parts are actual instrumentation – somehow this blurring accentuates the sense of the child’s enclosed, imaginary world. He even manages to use what sounds like a kazoo to actually add something to the song rather than turn it daft or lightweight as might so easily have been the case. Mark has gone on to do a great deal in music so I am sure to be posting about him again. And so to the tricky second album… Fading Yellow Volume 2 draws inspiration from across the pond. There is a fairly sustained mood throughout – minor key, surprisingly melancholy, not dark, as such, more like sunshine breaking through overhanging branches or firelight patterns on the walls – so this collection works well listened to as a whole (perhaps omitting tracks 17-21, interesting curios which nevertheless feel a little as if they are tagging along to flesh things out). Cover artists Disraeli appear in matching red hunting-style jackets, white polo-necks and sporting immaculate side-partings leading you to think they’re a garage band or a Paul Revere outfit turned serious for the psychedelic dawn (though this is from 1968). B-side to Spinnin’ Around, What Will the New Day Bring *** is gently chugging, dreamy folk-pop with a fateful or even foreboding mood – a little Spanish guitar decorates strummed guitars and lazy (in a good way) vocals. This is very well regarded by many and its premier position suggests Fading Yellow’s Jörgen Johansson recognises a strong lead-off when he hears one but I can’t get why it’s so mightily favoured. ‘We played our pipes for you but you didn’t dance’… There is a Curt Boettcher influence in the arrangement for The Network’s Ears of Stone *** recalling tracks like It’s a Sad World and Glass but lacking the melodicism of the former and the inspiration of the latter to lift this to four stars. Percussion, sitar, woodwind, organ and strikes of electric guitar conjure a shadowy atmosphere but the song never quite transcends itself. The Whispers’ Knowin’ *** is energetic garage pop with a soulful vocal, a mournful oboe and a crazy but short-lived instrumental freakout. The child-woman who inhabits many ’60s psych songs flits through The July Four’s sunshine elegy, Frightened Little Girl **** ‘looking for a world, one that she doesn’t know.’ Some might say this is cheesy but there’s a good song here and I like its air of innocence wrapped up in those ba-ba-ba vocals. Calliope’s I’ll Take It Back *** is harmony-rich tambourine driven guitar-pop with nice electric guitar work and a surprise change of pace for an extended lead off. Never Mind, I’m Freezing *** – a great arresting title which turns out to be an early single from HP Lovecraft vocalist George Edwards. It comes with peeling guitars and an insistent heavy drum beat. I know this single has its fans but it’s a bit of a dirge for me I’m afraid. After a light start, How Many Tears *** by The Poor emerges as slow building folk-rock with lovely soft vocals and a detuned leaping octave electric lead-off. It took three listens for me to fall for The Happy Return’s mellow, melodic, mellotronic harmony-pop, I Thought I Loved Her *****. A summer-turned-to-autumn mood pervades, melancholy verses giving way to cathartic choruses and an unusual wavering motif around the title. There’s something of a Moody Blues sound here, though less magisterial, of course… maybe it’s the flute-like mellotron and chorus vocals. I’ve found myself humming this one. From the start Don’t Say No ***** by The Oracle sounds unmistakably like a Curt Boettcher production and indeed it is produced by Curt and Keith Olsen. The song was written by one ‘Friedmann.’ Is that Curt on vocals? The register is too low, surely. The Oracle were presumably another band that he lent his talents to, working wonderful magic with sitar, oscillating wind effects and cascading vocal harmony choruses. This can sit proudly alongside anything produced by The Millennium. There is more minor key moodiness courtesy of The Dynamics’ All She Said *** and then we have The Holy Mackerel’s Scorpio Red ***. It’s interesting how well this Mackerel piece fits into the Volume 2 template. Paul Williams’s songwriting nous is unmistakable through the psychedelic lens. Track 13, Trust, by The Peppermint Trolley Company ***** is probably the loveliest thing on Volume 2. Arranged by Chad Stuart (Chad & Jeremy) with flutes and harpsichord aplenty, The Trolley provide the harmonies to this great Paul Williams and Roger Nichols song. No great originality is added to Paul Williams’s own version on his 1969 solo album Someday Man, but this is a highly enjoyable piece all the same, deserving five stars even if it is a straightforward cover. And here they are in action, looking just like a Peppermint Trolley Company should. The Summer Skies by The Higher Elevation *** is Volume 2’s sunniest offering – ‘let’s pretend the whole world is made out of great big red balloons’ – and this was co-written by John Carter and Tim Gilbert of The Rainy Daze (they also co-wrote Incense and Peppermints). Chris and Craig’s Isha **** is an insistent and exotic eastern skewed piece with crazed harpsichord from the future Penny Arkade duo whilst Where Is Mary? by The Backseat *** is of interest as it was written and produced by Larry Tamblyn of The Standells. There is a slight dip in quality for the remainder of Volume 2 (final track excepted, as we shall see). Tracks 17-21 just seem less remarkable than most of what has gone before. The Poor’s Come Back Baby *** is a nice mellow piece with chiming guitar but the lyrics are a tad uninspired. The Cascades I Bet You Won’t Stay ** is where frat-pop meets the Fading Yellow’s outer fringes. Apart from some nice vocal harmonies, the main interest here is that this is the same group who had a major hit with Rhythm of the Rain back in 1962. Tracks 19, 20 and 21 come from an undated Canadian promotional EP, Live from Vancouver so these are real curios. The three songs are the competent soul-psych-pop of The Sound Set’s Mind in a Bottle *** , Sea of Dreams by The Reign *** – enjoyable guitar/drums interplay which takes off into a brief garage phase before echoing out – and the sunny day but slightly pedestrian psych-pop of In a Whirl by The Look *** If sound quality is important to you, you might want to take away a star for tracks 19 and 20. Expecting the very last track to be either another obscurer than obscure obscurity or a triumphant finale, what we get instead is a perky little instrumental. And very welcome it is too. Mystery Track 22 is Mr Miff ***, the B-side to Track 4. It’s a really nice mid-’60s guitar-led piece with a playful air and it turns out to be the perfect way to round off Volume 2. I’m tempted to give it four stars. Fading Yellow is moonlight through leaded glass windows; it’s the face of a girl barely glimpsed in an antique mirror; it’s basking in the lysergic sunshine of an imagined Edwardian afternoon. Let’s hear it for Fading Yellow (but quietly, please). For a limited edition, low profile series which barely whispers its name, Fading Yellow has proved remarkable in the breadth and longevity of its quaintly bespectacled view. For over ten years, within sleeves of assorted late-Victorian, Beardsley-like beauty, Fading Yellow has faithfully gathered together obscurities from the golden age of pop-psych (or is that pop-syke – I never know), unearthing some true gems along the way. Whilst its very particular vision has evolved, the emphasis tends to remain very much on the melodic, orchestrated side of the spectrum. Here, I’m reaching right back to that first CD. I don’t have all the Fading Yellow releases as they are, by their very nature, frightfully obscure. But I feel confident in saying this initial offering is consistently strong and an altogether delightful listen from start to finish. So let’s begin with Kate’s Strange Girl. ***** Cy Payne’s swirling strings and sinuous sax evoke a skewed mood of feminine mystique: ‘Strange girl, Strange way of talking… ’. The arrangement adds a good deal to this song. Cy Payne’s background is the solidly mainstream world of big bands and regimental occasions but within a Fading Yellow context, that sensibility and a careful choice of instrumentation conjures up an enticing otherworldly strangeness which, unfortunately, is allowed to dissipate somewhat during the more conventional choruses. Is Angela merely a figment of imagination? That Lonely Feeling *** is by pre-Marmalade Dean Ford and the Gaylords. Written by Carter-Lewis, it’s a nice beat song with an understated bitter-sweet flavour. This, and especially the follow-up single A-side ‘He’s a Good Face’ segue fairly effortlessly into early Marmalade. Despite a Alan Hawkshaw arrangement, Eddy Howell’s Easy Street *** strains a little during its choruses. Still, this is enjoyably carefree orchestrated pop with a ‘Penny Lane’ beat. Oh, What a Lovely Day **** is prime pop-psyke by Steff Sulke, the ‘Swiss Curt Boettcher’ say the liner notes and indeed Lovely Day alludes to a Millennium dynamic sensitivity with a carefully engineered hummingness and there’s a nod to early Pink Floyd at times thanks to the organ. John Williams’s Flowers in Your Hair *** is modesty-becomes-you, lightly produced folk-pop – from 1967, of course. I can hear a slightly more produced version of Zephyrs’ I Just Can’t Take It **** though this guitar/organ version is really fine. ‘Imagine yourself on a tropical ship’ invites Jon in Is it Love? **** Heavily treated vocals and strong backing from two members of Lulu’s band (and later Colin Blunstone’s backing group) make for a heady concoction. A standout track is Koobas [below] cover of Burt Jansch’s Woe Is Love, My Dear **** where emotive vocals combine with an overall quietist feel courtesy of strings and piano. There is a satisfying blend of pop/pysch/folk going on here. The song’s effectiveness stems from its straining to offer reassurance amidst a sense of melancholic unease. I’m not a country fan but when country goes head-to-head with psychedelia and when the song is written by Neil Diamond, that’s a different matter. Quintin E. Klopjaeger & the Gonks’ The Long Way Home **** is different from anything else on offer here with its darker edge and lower register vocals. And a Diamond quality shines through. Sundragon’s Far Away Mountain *** is wide-eyed orchestral pop from the ex-Sands duo. After a slightly harsh sound in its intro, Juan and Junior’s Andurina **** gives way to an insistently melodic, innocent Kaleidoscope-like song. If you prefer a lighter, flutey version without electric guitars, you’ll find it on Youtube. Look out too for the A-side, To Girls, (Circus Days Vol 4) which has a lovely cinematic/melancholy quality with brief break-outs into garage. With its self-conscious, slightly faltering vocals, Hamlet’s She Won’t See the Light *** is one of those actorly ‘60s songs where you imagine Hamlet plucking petals from a flower as he mourns his lot in life. And so to Paul & Barry Ryan’s Madrigal *****, the twins’ last single though not written by Barry. Madrigal takes elements of A-side Pictures of Today a stage further. The sound quality isn’t great but the song and performance are, with a perfect balance of humour and sincerity making for mock-medieval swooning loveliness. There are good sounding drums and delicate glockenspiels and what could be better than a sitar peel to close? If the picture-sleeve is to be believed, Red Lady *** could be about Phil Cordell’s red setter. This song is loaded with fantastic elastic guitar throughout. Next up, are both sides of a Ronnie Bird single. Sad Soul **** is the better of the two with its sense of longed for escape – ‘Grab hold of a star for me’ – whilst Rain in the City *** has a heavier, almost garage sound. Elliots Sunshine’s Cos I’m Lonely” ***** – like many songs on this ‘Fading Yellow’, a B-side – has surfaced on several compilations and deservedly so. With its blissful air of softness, warmth and light, ‘Cos I’m Lonely’ is one of those ’60s gossamer, as-if-out-of-thin-air songs. Here it comes complete with lovely melody, groovy organ solo, sweet strings. Loneliness has never sounded so good. I wonder what the A-side is like? Peter Janes‘ Cat Stevens-produced Do You Believe (Love Is Built on a Dream) **** is strong melodic pop with a little garage guitar. ‘What need have we for answers? For we are just dancers in the wind…’ so say Bliss in Lifetime *** orchestrated folk-pop with a pastoral feel. This was the B-side of their only single with the A-side, ‘Courtyards of Castile’, nowhere to be found although Pneumatic Bliss on MySpace suggests a blissful re-emergence. The Jackpots’ King of the World ***** is a great pop single and one of the most commercial tracks here. A playful piano intro gives way to close-up verses contrasting with fuller reverb bridge/choruses. There is a smart trumpet break, glockenspiel throughout and lyrics like ‘I would tax the rich, give bread to the poor, love the old.’ And not forgetting those bursts of haha! vocals. Dreamin’ *** is a harmony and guitar-led major-minor Hollies-like song by Norwegian band Members of Time, leading into final track, Aerovons’ World of You **** – ‘It’s a new world of you and I’m just a stranger here’… Like so many ’60s singles it had hit potential and yet failed to chart. There is an Abbey Road album which I haven’t heard yet. The three/four stars sometimes blur around the edges but don’t take my word for it. ‘Fading Yellow’ was made for you to enjoy.